Back in April 2015, Telltale announced it would be working to adapt a Marvel property into one of its story-driven games. Today, we've learned what that property is: Guardians of the Galaxy. But before you go hooting and hollering about how exciting this is, there's the small matter of how the information was revealed. We reported in October that the Screen Actors Guild‐American Federation of Television and Radio Artists (SAG-AFTRA), a union that represents many voice actors in the video game industry, was calling for a strike. That strike is now in effect, and SAG-AFTRA has released a list of games with which the organization has not reached new deals. The list, spotted by Comic Book Movie, includes Telltale's Guardians of the Galaxy. So, what does this mean for the game - which hasn't yet been officially announced? Maybe nothing. Negotiations with SAG-AFTRA are still underway, and both sides should be interested in resolving the dispute as soon as possible. 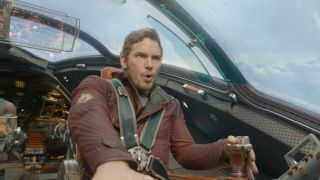 Now that people know a Guardians of the Galaxy game could be coming, I imagine the pressure will be on as fans clamor for the chance to take a spin around the galaxy as Star-Lord and co.